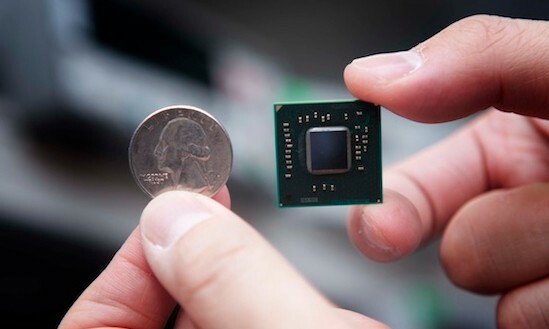 Little notches like this can shape Intel's big move into the mobile market. What you are seeing above is a prototype chip codenamed 'Rosepoint' that somehow crams a digital WiFi radio and a dual-core Atom CPU onto the same piece of silicon. Interference would normally make such proximity impossible, but Rosepoint incorporates new anti-radiation and noise-cancelling shielding to prevent the components from corrupting each other. The aim isn't just to shrink everything, but also to deliver "state of the art power efficiency" by removing unnecessary circuitry. Intel even claims it can fit the RF antenna onto a chip too, but it doesn't want to show that off just yet. There is too many prying eyes watching their every move.